I was having a look through SpiderMonkey's source code today and found something interesting about how it represents heap objects and wanted to share. Incidentally, JSC's implementation was taken from V8. V8's was taken from Dart. Dart's was taken from Go. We might take SpiderMonkey's from Scheme48. Good times, right?? When seeing if SpiderMonkey could use this same strategy, I couldn't find how to make a variable-sized GC-managed allocation. It turns out that in SpiderMonkey you can't do that! SM's memory management system wants to work in terms of fixed-sized "cells". Even for objects that store properties inline in named slots, that's implemented in terms of standard cell sizes. So if an object has 6 slots, it might be implemented as instances of cells that hold 8 slots. Truly variable-sized allocations seem to be managed off-heap, via malloc or other allocators. I am not quite sure how this works for GC-traced allocations like arrays, but let's assume that somehow it does. Anyway, the point of this blog post. I was looking to see which part of SpiderMonkey reserves space for type information. For example, almost all objects in V8 start with a "map" word. This is the object's "hidden class". To know what kind of object you've got, you look at the map word. That word points to information corresponding to a class of objects; it's not available to store information that might vary between objects of that same class. Interestingly, SpiderMonkey doesn't have a map word! Or at least, it doesn't have them on all allocations. Concretely, BigInt values don't need to reserve space for a map word. I can start storing data right from the beginning of the object. But how can this work, you ask? How does the engine know what the type of some arbitrary object is? For objects promoted out to the heap ("tenured" objects), objects of similar kinds are allocated in the same memory region (in kind-specific "arenas"). There are about a dozen trace kinds, corresponding to arena kinds. To get the kind of object, you find its arena by rounding the object's address down to the arena size, then look at the arena to see what kind of objects it has. There's another cell bit reserved to indicate that an object has been moved, and that the rest of the bits have been overwritten with a forwarding pointer. These two reserved bits mostly don't conflict with any use a derived class might want to make from the first word of an object; if the derived class uses the first word for integer data, it's easy to just reserve the bits. If the first word is a pointer, then it's probably always aligned to a 4- or 8-byte boundary, so the low bits are zero anyway. The upshot is that while we won't be able to allocate digits inline to BigInt objects in SpiderMonkey in the general case, we won't have a per-object map word overhead; and we can optimize the common case of digits requiring only a word or two of storage to have the digit pointer point to inline storage. GC is about compromise, and it seems this can be a good one. Well, that's all I wanted to say. Looking forward to getting BigInt turned on upstream in Firefox! I am on my way back from FOSDEM and thought I would share with yall some impressions from talks in the Networking devroom. I didn't get to go to all that many talks -- FOSDEM's hallway track is the hottest of them all -- but I did hit a select few. Thanks to Dave Neary at Red Hat for organizing the room. The day started with a drum-beating talk that was very light on technical information. Essentially Ray was arguing for an evolution of network function virtualization -- that instead of running VNFs on bare metal as was done in the days of yore, that people started to run them in virtual machines, and now they run them in containers -- what's next? Ray is saying that "cloud-native VNFs" are the next step. Cloud-native VNFs to move from "greedy" VNFs that take charge of the cores that are available to them, to some kind of resource sharing. "Maybe users value flexibility over performance", says Ray. It's the Care Bears approach to networking: (resource) sharing is caring. In practice he proposed two ways that VNFs can map to cores and cards. One was in-process sharing, which if I understood him properly was actually as nodes running within a VPP process. Basically in this case VPP or DPDK is the scheduler and multiplexes two or more network functions in one process. The other was letting Linux schedule separate processes. In networking, we don't usually do it this way: we run network functions on dedicated cores on which nothing else runs. Ray was suggesting that perhaps network functions could be more like "normal" Linux services. Ray doesn't know if Linux scheduling will work in practice. Also it might mean allowing DPDK to work with 4K pages instead of the 2M hugepages it currently requires. This obviously has the potential for more latency hazards and would need some tighter engineering, and ultimately would have fewer guarantees than the "greedy" approach. All the diagrams show Kubernetes managing CPU node allocation and interface assignment. I guess in marketing diagrams, Kubernetes has completely replaced OpenStack. One slide showed guest VNFs differentiated between "virtual network functions" and "socket-based applications", the latter ones being the legacy services that use kernel APIs. It's a useful terminology difference. The talk identifies user-space networking with DPDK (only!). Finally, I note that Conway's law is obviously reflected in the performance overheads: because there are organizational isolations between dev teams, vendors, and users, there are big technical barriers between them too. The least-overhead forms of resource sharing are also those with the highest technical consistency and integration (nodes in a single VPP instance). This was a talk about getting good throughput from the NIC to userspace, but by using some kernel facilities. The idea is to get the kernel to set up the NIC and virtualize the transmit and receive ring buffers, but to let the NIC's DMA'd packets go directly to userspace. The performance goal is 40Gbps for thousand-byte packets, or 25 Gbps for traffic with only the smallest packets (64 bytes). The fast path does "zero copy" on the packets if the hardware has the capability to steer the subset of traffic associated with the AF_XDP socket to that particular process. The AF_XDP project builds on XDP, a newish thing where a little kind of bytecode can run on the kernel or possibly on the NIC. One of the bytecode commands (REDIRECT) causes packets to be forwarded to user-space instead of handled by the kernel's otherwise heavyweight networking stack. AF_XDP is the bridge between XDP on the kernel side and an interface to user-space using sockets (as opposed to e.g. AF_INET). The performance goal was to be within 10% or so of DPDK's raw user-space-only performance. The benefits of AF_XDP over the current situation would be that you have just one device driver, in the kernel, rather than having to have one driver in the kernel (which you have to have anyway) and one in user-space (for speed). Also, with the kernel involved, there is a possibility for better isolation between different processes or containers, when compared with raw PCI access from user-space..
AF_XDP is what was previously known as AF_PACKET v4, and its numbers are looking somewhat OK. Though it's not upstream yet, it might be interesting to get a Snabb driver here. I would note that kernel-userspace cooperation is a bit of a theme these days. There are other points of potential cooperation or common domain sharing, storage being an obvious one. However I heard more than once this weekend the kind of "I don't know, that area of the kernel has a different culture" sort of concern as that highlighted by Daniel Vetter in his recent LCA talk. This talk is hard to summarize. Like the previous one, it's again about getting packets to userspace with some support from the kernel, but the speaker went really deep and I'm not quite sure what in the talk is new and what is known. François-Frédéric is working on a new set of abstractions for relating the kernel and user-space. He works on OpenDataPlane (ODP), which is kinda like DPDK in some ways. ARM seems to be a big target for his work; that x86-64 is also a target goes without saying. His problem statement was, how should we enable fast userland network I/O, without duplicating drivers? He was also a bit skeptical about standardizing on the "packet array I/O model" which AF_XDP and most NICS use. What he means here is that most current NICs move packets to and from main memory with the help of a "descriptor array" ring buffer that holds pointers to packets. A transmit array stores packets ready to transmit; a receive array stores maximum-sized packet buffers ready to be filled by the NIC. The packet data itself is somewhere else in memory; the descriptor only points to it. When a new packet is received, the NIC fills the corresponding packet buffer and then updates the "descriptor array" to point to the newly available packet. This requires at least two memory writes from the NIC to memory: at least one to write the packet data (one per 64 bytes of packet data), and one to update the DMA descriptor with the packet length and possible other metadata. Although these writes go directly to cache, there's a limit to the number of DMA operations that can happen per second, and with 100Gbps cards, we can't afford to make one such transaction per packet. François-Frédéric promoted an alternative I/O model for high-throughput use cases: the "tape I/O model", where packets are just written back-to-back in a uniform array of memory. Every so often a block of memory containing some number of packets is made available to user-space. This has the advantage of packing in more packets per memory block, as there's no wasted space between packets. This increases cache density and decreases DMA transaction count for transferring packet data, as we can use each 64-byte DMA write to its fullest. Additionally there's no side table of descriptors to update, saving a DMA write there. Apparently the only cards currently capable of 100 Gbps traffic, the Chelsio and Netcope cards, use the "tape I/O model". Incidentally, the DMA transfer limit isn't the only constraint. Something I hadn't fully appreciated before was memory write bandwidth. Before, I had thought that because the NIC would transfer in packet data directly to cache, that this wouldn't necessarily cause any write traffic to RAM. Apparently that's not the case. Later over drinks (thanks to Red Hat's networking group for organizing), François-Frédéric asserted that the DMA transfers would eventually use up DDR4 bandwidth as well. However if the evicted cache line is from some other address, we might have to flush to RAM if the cache line is dirty. That causes a memory write traffic. But if the cache line is clean, that means it was probably loaded as part of a memory read operation, and then that means we're evicting part of the network function's working set, which will later cause memory read traffic as the data gets loaded in again, and write traffic to flush out the DMA'd packet data cache line. François-Frédéric simplified the whole thing to equate packet bandwidth with memory write bandwidth, that yes, the packet goes directly to cache but it is also written to RAM. I can't convince myself that that's the case for all packets, but I need to look more into this. Talking with Snabb's Luke Gorrie later on, he thought that it could be that we can still stretch the packet array I/O model for a while, given that PCIe gen4 is coming soon, which will increase the DMA transaction rate. So that's a possibility to keep in mind. At the same time, apparently there are some "coherent interconnects" coming too which will allow the NIC's memory to be mapped into the "normal" address space available to the CPU. In this model, instead of having the NIC transfer packets to the CPU, the NIC's memory will be directly addressable from the CPU, as if it were part of RAM. The latency to pull data in from the NIC to cache is expected to be slightly longer than a RAM access; for comparison, RAM access takes about 70 nanoseconds. For a user-space networking workload, coherent interconnects don't change much. You still need to get the packet data into cache. True, you do avoid the writeback to main memory, as the packet is already in addressable memory before it's in cache. But, if it's possible to keep the packet on the NIC -- like maybe you are able to add some kind of inline classifier on the NIC that could directly shunt a packet towards an on-board IPSec accelerator -- in that case you could avoid a lot of memory transfer. That appears to be the driving factor for coherent interconnects. At some point in François-Frédéric's talk, my brain just died. I didn't quite understand all the complexities that he was taking into account. 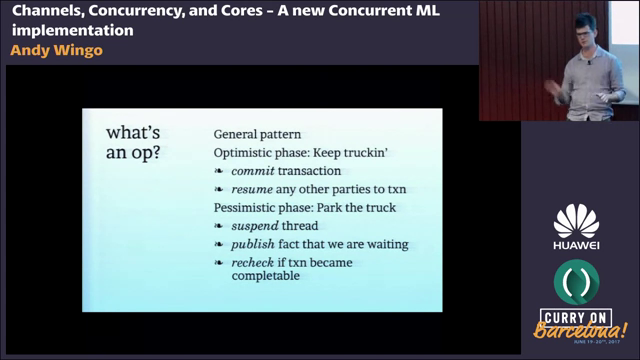 Later, after he kindly took the time to dispell some more of my ignorance, I understand more of it, though not yet all :) The concrete "deliverable" of the talk was a model for kernel modules and user-space drivers that uses the paradigms he was promoting. It's a work in progress from Linaro's networking group, with some support from NIC vendors and CPU manufacturers. This talk had the most magnificent beginning: a sort of "repent now ye sinners" sermon from Luke Gorrie, a seasoned veteran of software networking. Luke started by describing the path of righteousness leading to "driver heaven", a world in which all vendors have publically accessible datasheets which parsimoniously describe what you need to get packets flowing. In this blessed land it's easy to write drivers, and for that reason there are many of them. Developers choose a driver based on their needs, or they write one themselves if their needs are quite specific. But there is another path, says Luke, that of "driver hell": a world of wickedness and proprietary datasheets, where even when you buy the hardware, you can't program it unless you're buying a hundred thousand units, and even then you are smitten with the cursed non-disclosure agreements. In this inferno, only a vendor is practically empowered to write drivers, but their poor driver developers are only incentivized to get the driver out the door deployed on all nine architectural circles of driver hell. So they include some kind of circle-of-hell abstraction layer, resulting in a hundred thousand lines of code like a tangled frozen beard. We all saw the abyss and repented. Luke described the process that led to Mellanox releasing the specification for its ConnectX line of cards, something that was warmly appreciated by the entire audience, users and driver developers included. Wonderful stuff. My Igalia colleague Asumu Takikawa took the last half of the presentation, showing some code for the driver for the Intel i210, i350, and 82599 cards. For more on that, I recommend his recent blog post on user-space driver development. It was truly a ray of sunshine in dark, dark Brussels. This talk was a delightful introduction to VPP, but without all of the marketing; the sort of talk that makes FOSDEM worthwhile. Usually at more commercial, vendory events, you can't really get close to the technical people unless you have a vendor relationship: they are surrounded by a phalanx of salesfolk. But in FOSDEM it is clear that we are all comrades out on the open source networking front. The speaker expressed great personal pleasure on having being able to work on open source software; his relief was palpable. A nice moment. He also had some kind words about Snabb, too, saying at one point that "of course you can do it on snabb as well -- Snabb and VPP are quite similar in their approach to life". He trolled the horrible complexity diagrams of many "NFV" stacks whose components reflect the org charts that produce them more than the needs of the network functions in question (service chaining anyone?). He did get to drop some numbers as well, which I found interesting. One is that recently they have been working on carrier-grade NAT, aiming for 6 terabits per second. Those are pretty big boxes and I hope they are getting paid appropriately for that :) For context he said that for a 4-unit server, these days you can build one that does a little less than a terabit per second. I assume that's with ten dual-port 40Gbps cards, and I would guess to power that you'd need around 40 cores or so, split between two sockets. Finally, he finished with a long example on lightweight 4-over-6. Incidentally this is the same network function my group at Igalia has been building in Snabb over the last couple years, so it was interesting to see the comparison. I enjoyed his commentary that although all of these technologies (carrier-grade NAT, MAP, lightweight 4-over-6) have the ostensible goal of keeping IPv4 running, in reality "we're day by day making IPv4 work worse", mainly by breaking the assumption that just because you get traffic from port P on IP M, doesn't mean you can send traffic to M from another port or another protocol and have it reach the target. OK that's it. If I get around to writing up the couple of interesting Java talks I went to (I know right?) I'll let yall know. Happy hacking! Greetings, fellow Schemers and compiler nerds: I bring fresh nargery! Now we get more to the compiler side of things. Currently in Guile's VM there are instructions like vector-ref. This is a little silly: there are also instructions to branch on the type of an object (br-if-tc7 in this case), to get the vector's length, and to do a branching integer comparison. Really we should replace vector-ref with a combination of these test-and-branches, with real control flow in the function, and then the actual ref should use some more primitive unchecked memory reference instruction. Optimization could end up hoisting everything but the primitive unchecked memory reference, while preserving safety, which would be a win. But probably in most cases optimization wouldn't manage to do this, which would be a lose overall because you have more instruction dispatch. Now that I'm getting close to finished I wanted to share some thoughts. Previous progress reports on the mailing list. As an example, consider this loop that sums the 32-bit floats in a bytevector. I've annotated the code with lines and columns so that you can correspond different pieces to the assembly. So, already Guile's compiler has hoisted the (bytevector-length bv) and unboxed the loop index n and accumulator sum. This work aims to simplify further by exploding bv-f32-ref. In practice, instruction explosion happens in CPS conversion, as we are converting the Scheme-like Tree-IL language down to the CPS soup language. When we see a Tree-Il primcall (a call to a known primitive), instead of lowering it to a corresponding CPS primcall, we inline a whole blob of code. As you can see, there are four branches hidden in the bv-f32-ref: two to check that the object is a bytevector, and two to check that the index is within range. In this explanation we assume that the offset idx is already unboxed, but actually unboxing the index ends up being part of this work as well. One of the goals of instruction explosion was that by breaking the operation into a number of smaller, more orthogonal parts, native code generation would be easier, because the compiler would only have to know about those small bits. However without an optimizing compiler, it would be better to reify a call out to a specialized bv-f32-ref runtime routine instead of inlining all of this code -- probably whatever language you write your runtime routine in (C, rust, whatever) will do a better job optimizing than your compiler will. The first thing to note is that unlike the "before" code, there's no instruction in this loop that can throw an exception. Neat. Next, note that there's no type check on the bytevector; the peeled iteration preceding the loop already proved that the bytevector is a bytevector. And indeed there's no reference to the bytevector at all in the loop! The value being dereferenced in (f32-ref 2 5 2) is a raw pointer. (Read this instruction as, "sp = *(float*)((byte*)sp + (uptrdiff_t)sp)".) The compiler does something interesting; the f32-ref CPS primcall actually takes three arguments: the garbage-collected object protecting the pointer, the pointer itself, and the offset. The object itself doesn't appear in the residual code, but including it in the f32-ref primcall's inputs keeps it alive as long as the f32-ref itself is alive. Here the error ends up lowering to a throw CPS term that the compiler recognizes as a bailout and renders out-of-line; cool. But it uses idx as an argument, as a tagged SCM value. The compiler untags the loop index, but has to keep a tagged version around for the error cases. The right fix is probably some kind of allocation sinking pass that sinks the tag-fixnum to the bailouts. Oh well. Additionally, there are two tests in the loop. Are both necessary? Turns out, yes :( Imagine you have a bytevector of length 1025. The loop continues until the last ref at offset 1024, which is within bounds of the bytevector but there's one one byte available at that point, so we need to throw an exception at this point. The compiler did as good a job as we could expect it to do. is is worth it? where to now? On the one hand, instruction explosion is a step sideways. The code is more optimal, but it's more instructions. Because Guile currently has a bytecode VM, that means more total interpreter overhead. Testing on a 40-megabyte bytevector of 32-bit floats, the exploded f32v-sum completes in 115 milliseconds compared to around 97 for the earlier version. On the other hand, it is very easy to imagine how to compile these instructions to native code, either ahead-of-time or via a simple template JIT. You practically just have to look up the instructions in the corresponding ISA reference, is all. The result should perform quite well. I will probably take a whack at a simple template JIT first that does no register allocation, then ahead-of-time compilation with register allocation. Getting the AOT-compiled artifacts to dynamically link with runtime routines is a sufficient pain in my mind that I will put it off a bit until later. I also need to figure out a good strategy for truly polymorphic operations like general integer addition; probably involving inline caches. So that's where we're at :) Thanks for reading, and happy hacking in Guile in 2018! This question is designed to see if how a potential collaborator is going to fit into a diverse team. Are they going to behave well to their coworkers, or will they be a reason why people leave the group or the company? You then follow up with a question about how you would go about improving gender balance, what the end result would look like, what's doable in what amount of time, and so on. Other versions of the question could talk about the composition of the industry (or of academia) in terms of race, sexual orientation, gender identity, and so on. I haven't tried this test yet but am looking forward to it. I am hoping that it can shed some light on someone's ability to empathize with people from another group, and in that sense I think it's probably best to ask about a group that the candidate does not belong to (in as much as it's possible to know). The candidate will also show who they listen to and who they trust -- how do they know what they know? Do they repeat stories told about people of that group or by people of that group? Some candidates will simply be weak in this area, and won't be able to say very much. The person would require more training, and after an eventual hire it would be expected that this person says more ignorant things. Unfortunately unlike ignorance about compilers, say, ignorance about the lived experience of women compiler writers, say, can lead to hurtful behavior, even if unintentional. For this reason, ignorance is a negative point about a candidate, though not a no-hire signal as such. Obviously if you discover a person that thinks that gender imbalance is just the way it is and that nothing can or should be done about it, or that women don't program well, or the like, then that's a great result: clear no-hire. This person is likely to make life unpleasant for their female colleagues, and your company just avoided the problem. High fives, interview team! Alternately, if you find a candidate who deeply understands the experience of a group that they aren't a part of and who can even identify measures to improve those peoples' experience in your company and industry, then you've found a gem. I think it can easily outweigh a less strong technical background, especially if the person has a history of being able to learn and train on the job (or on the open-source software project, or in the university course, etc). Postscript: The question is a template -- ideally you ask about a group the person is not in. A kind commenter correctly pointed out that the article looks like I would only interview men and that definitely wasn't what I was going for!